According to many traditional systems of cosmology and medicine, all of creation is composed of and governed by five elements – earth, water, fire air and space. These five elements are considered the fundamental constituents of each individual, and represent progressively more subtle aspects of our being. In yoga practice and in daily living, we can use the model of the five elements to help us create balance and health in our lives. The first element is earth, and this element relates to the framework of the body – the bones and muscles. The qualities of this element are solidity, form and stability. 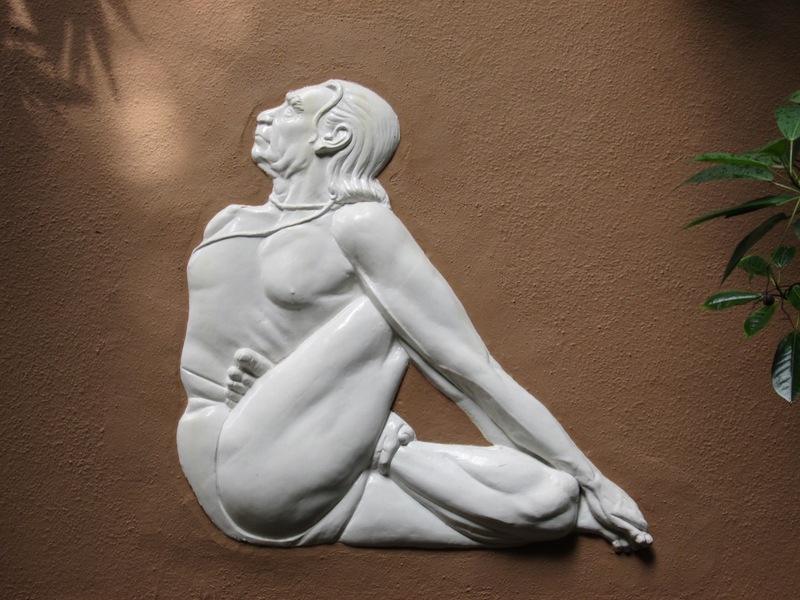 When we learn a new yoga posture, this is where we begin. We get the basic shape of the pose, and then begin to refine the relationships between the parts of the structure. This balanced alignment makes the structure more stable and less subject to strain. The earth aspect of a pose is its foundation, that part of the body that is touching the floor. When you press your feet into the floor in Mountain Pose, or press your hands firmly into the mat in Downward Facing Dog Pose, you are expressing the earth element. The next element is water, which corresponds to the internal organs of the body. If the earth element of the musculo-skeletal system is like a container, the water element of the organic body is its contents. These inner structures are softer and literally contain more liquid. The qualities of the water element are weight combined with fluidity and adaptability. As the outer forms of our poses become more organized and familiar, we can begins to sense movement within the stillness of the form. The movement of breath, circulation, heartbeat and digestion are all rhythmic expressions of the organic body. When we experience ourselves as being firm but not rigid, receptive but not collapsed, we are balancing the elements of earth and water. The element of fire is hot, stimulating and invigorating. In our practice, the fire element isn’t stimulated only when we are heated and sweating. The fire element is related to the brain and nervous system, and to the mind and emotions, known as manas. Our thoughts move like electric current along our nerves. To harness the energy of our thoughts and emotions requires will power. This element is accessed when we use the fire of our will to practice regularly, to try challenging poses or to extend our holding times. We can also use our will and awareness to tame the constant movement of this outer layer of the mind and to work skillfully with habitual emotional patterns. To work with the mind and will in this way is to access the power of the fire element. We have moved from solidity of earth, to the adaptability of water and the heat of fire. Now we come to the air element, which expresses lightness and movement. On the outer level, the air element connects to our skin, as we feel the touch of wind on our skin. Moving from the skin makes our movements more refined and sensitive. On the inner level, the air element relates to breathing and the circulation of prana or life force through the body. On the subtle level, the air element relates to a deeper aspect of mind, the discriminating intelligence known as buddhi. This intelligence lets us make distinctions and value judgments, supporting choices based on deep wisdom rather than on old patterns or habitual desires. When we do yoga, the air element helps us refine our postures and apply mental acuity to our practice. We learn to be highly alert, yet calm, and able to discern subtle ways to move towards effortless effort. The air element supports the journey inward to experience a quiet and stable mind. The final element in this model is that of space, considered the container or womb of all existence. This constituent, also known as ether, relates to consciousness and to sound. Sound is vibration, which is subtler than form and from the yogic point of view, the very foundation of form, as all matter is made up of vibrating atoms. We know from modern science that all matter is 99.99% empty space, with infinitesimally small particles or waves moving in ever-changing relationships. Connecting to the space element helps us to recognize that on the deepest level of existence, everything is in constant flux, and therefore open to change and new possibilities. Practicing our postures from the point of view of the negative space – the space we are not filling – changes our perspective and enhances awareness. The space element supports us in coming to practice from a place of connection to the divine and openness to move beyond past conditioning. In any situation or any yoga practice, we can check in to see which elements are dominating the experience and which may be missing. As we move from the solidity of earth to the vastness of space, we penetrate the various layers of our being, bringing balance and harmony to the whole.